← First post of the year! With the weather continuing so mild, and it managing to not really rain very much for the past few days I was desperate to get onto my allotment this weekend. It is situated next to the footpath that I use twice a day to walk to and from the station and so I can’t help but notice it (although this time of the year it is still pretty dark when I pass which helps) and its untended state, since last autumn, has been bothering me. So this morning, rather than set to work on my usual Saturday chores; the Waitrose run, cleaning the house etc. I put the allotment first. I’d been given some old pallets last year by the allotment agent and wanted to add these to my existing compost heap – but to do this I had to move a compost dalek (you know the sort, the upside down dustbin type). This was full of weeds and other stuff I’d cleared away last year, so I needed to empty it before I could think about moving it. It was a grotty mucky job and I would have much preferred to be digging or weeding, but I did it, then hauled the pallets into place and suddenly things began to look tidier. I still have to sort out the neighbouring heap but that’s for another day, and when I can persuade my gardening apprentice to help me! Using the slots at the side of the pallets I fitted in canes and other sundry bits of wood to save them creating trip hazards on the ground, and finally moved the compost daleks alongside. 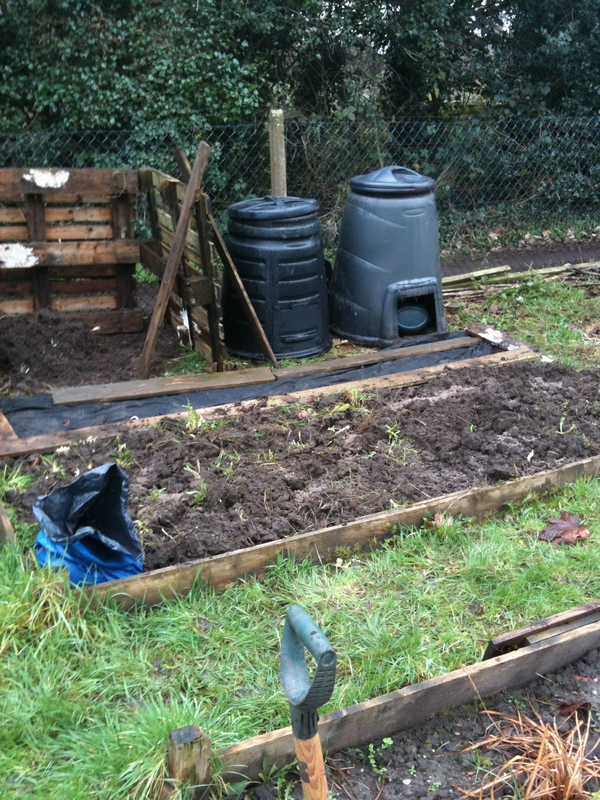 The last thing I did was to start to prepare the ground where I plan to grow my runner beans this year. I’d covered it with a black membrane for the past few months which had managed to kill off the couch grass (the roots are another matter) but the wretched dandelions are as strong as ever and despite being pallid looking through lack of light their roots are holding tight to the claggy soil. So I’ve contented myself with turning it all over and will return next week (weather permitting) to start the proper weeding. As I left so the robins which had been monitoring my every move were flying in to feast on the bugs and beasties I’d unearthed. All in all a good morning’s work! This entry was posted in Adventures in my allotment, Out of my garden and tagged allotment, gardening, outdoors. Bookmark the permalink. I used to love this web site. Thank you, I¡¦ll try and check back more frequently.